FloroBuild epoxy mortar system is used for resurfacing or leveling deteriorated or spalled concrete floors. Economically adding performance and durability, this epoxy mortar system provides a sanitary, skid-resistant surface that easily tolerates the harsh environments found in factory settings. FloroBuild is available in both a hand trowel and power trowel epoxy mortar floor coating version. Used in Commercial, Industrial and Institutional applications, such as: Heavy Industry, Foundries, Breweries, Loading Docks, Bottling Plants, and Wastewater Treatment Facilities. 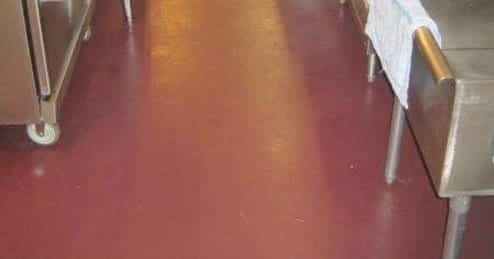 Product Advantages include: Seamless sanitary floor and coving, meets USDA requirements for incidental food contact in federally-inspected meat and poultry plants, excellent impact resistance and hardness, and a variety of colors can be achieved with the addition of Florock 100% Solids Colorants. FloroCrete SLX is a solvent free, low odor, slurry broadcast applied, self-leveling urethane cement floor coating system. It is specially formulated for areas where thermal shock, impact and chemical attack are issues. It allows moisture to move through it at a safe rate. It can be installed from a 1/8” neat system to a 3/16” with a media broadcast thickness. 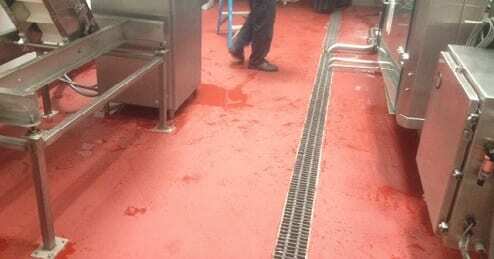 FloroCrete SLX urethane cement is ideally suited for: Kitchen floors and Fryer Areas, Vehicle Service Area Floors, Food Processing Plant Floors, Brewery floors, Winery floors, Dairy floors, Walk-In Coolers & Freezers, Bottling Facility floors, Laboratory floors, Chemical Processing Floors, Sanitation & Wash-down Areas. FloroBuild XT is an extra tough epoxy mortar floor repair material used for resurfacing or leveling extremely deteriorated or spalled concrete. Its proprietary fillers, which contain several gradations of steel, add extra tough abrasion and wear performance to the epoxy mortar material system. This makes for a tougher surface which can absorb and dissipate shock from impact. It provides a non-porous, sanitary, skid resistant surface that easily tolerates the harsh environments found in many settings. FloroBuild XT epoxy mortar floor coating is available natural or in various colors and is ideally suited for commercial, industrial and institutional applications such as Solid Waste Transfer Facilities, Loading Docks, and Dumpster Pads. FloroShop is a silica-filled, 100% solids, zero V.O.C. 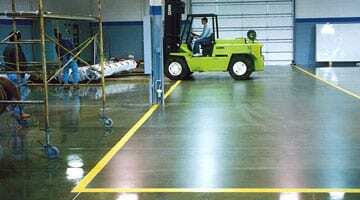 epoxy aggregate flooring system that restores deteriorated concrete floors and offers economical protection in situations where slippage, abrasion, or moderate impact are concerns. Aggregate-filled epoxy floors such as these provide a safe and durable option for industrial settings. Very easy to clean and maintain, these impervious epoxy aggregate coated floors prevent concrete dusting and retain their high performance over time. A hard-working, skid-resistant flooring value, FloroShop epoxy aggregate floor coating may be installed using a variety of textures, topcoats and finishes. FloroCrete RT is a solvent free, low odor, rake and trowel applied urethane cement slurry broadcast system that is designed for the most strenuous uses and activity. It is specially formulated for areas where thermal shock, heavy impact and chemical attack are issues. 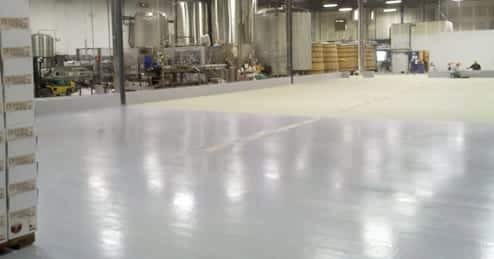 The urethane cement floor coating system allows moisture to move through it at a safe rate and it can be installed from a 3/16” to 1/4” thickness. System Advantages include: CA 01350 Air Quality Compliant; ADA Compliant; LEED Credits Available; Meets FDA, USDA & CFIA Standards; VOC Compliant/Low Odor; Thermal Shock Resistant; Heat Resistant to 235 degrees F; Contains Antimicrobial Additive; No Topcoat Required; Tolerates Dampness; High Chemical & Abrasion Resistance; Can be Applied to 7 to 14-Day-Old Concrete. FloroCrete HD is a solvent free, low odor, heavy duty, one-step, trowel applied urethane cement mortar floor coating system known for its thermal shock, heavy impact, abrasion and chemical resistance. It allows moisture to move through it at a safe rate. The urethane mortar system can be installed from a 1/4” to 3/8” thickness. 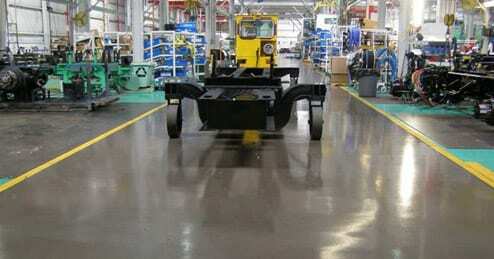 These hard-working urethane cement flooring systems, with their slip-resistant, antimicrobial and chemical-resistant properties, give you the same sanitary and easy-to-maintain finish day after day, regardless of your high-pressure steam cleaning, boiling liquid spills and other environmental factors. 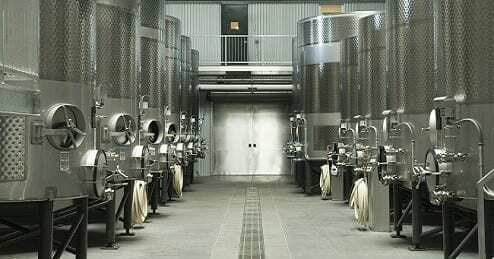 Even the punishing, higher temperature environment beneath industrial and commercial ovens is no match for our thermal shock resistant urethane cement flooring. Product Description: FloroCrete SLX is a solvent free, low odor, slurry-broadcast applied, self-leveling flooring system. It is specially formulated for areas where thermal shock, impact and chemical attack are issues. It allows moisture to move through it at a safe rate. System thickness can vary from 1/8” for a neat system to 3/16” when broadcast with choice of media. Impact Resistance ASTM D2794 >160 in lbs. Workable Life 1 Mixed Kit 15 min. Product Description: FloroCrete RT is a solvent free, low odor, rake/trowel slurry broadcast system that is designed for the most strenuous uses and activity. It is specially formulated for areas where thermal shock, heavy impact and chemical attack are issues. It allows moisture to move through it at a safe rate and it can be installed from a 3/16” to 1/4” thickness. Product Description: FloroCrete HD is a solvent free, low odor, heavy-duty, one-step, trowel applied mortar known for its thermal shock, heavy impact, abrasion and chemical resistance. It allows moisture to move through it at a safe rate and can be installed from 1/4” to 3/8” thickness. Workable Life* 1 Mixed Kit 15 min. Product Description: FloroBuild is used for resurfacing or leveling deteriorated or spalled concrete floors. Economically adding performance and durability, this system provides a sanitary, skid-resistant surface that easily tolerates the harsh environments found in factory settings. FloroBuild is available in both a hand trowel and power trowel version. Product Description: FloroBuild XT is an extra tough epoxy mortar used for resurfacing or leveling extremely deteriorated or spalled concrete. Its proprietary fillers, which contain several gradations of steel, add extra tough abrasion and wear performance. This makes for a tougher surface which can absorb and dissipate shock from impact. It provides a non-porous, sanitary, skid resistant surface that easily tolerates the harsh environments found in many settings. FloroBuild XT is available natural or in various colors. A variety of colors can be achieved with the addition of Florock 100% Solids Colorants at 1 to 2 quarts per batch.